Dr. R.L. Kashyap is Professor Emeritus of Electrical and Computer Engineering at Purdue University, Lafayette, Indiana in USA. He had his Masteras degree from Indian Institute of Science, Bengaluru and obtained ph. D. from Harvard University. He is the recipient of many International awards. In 2003 he has received ‘Vedanga Vidvan’ award instituted by Maharshi Sandipani Vedavidya Pratishthan (Ujjain), an autonomous body of HRD, Govt. of India. He was awarded the distinguished Alumnus award by IISC (Indian Institute of Science) in 2010. He is the receipient of Karnataka Rajyotsava Award 2012. He is honoured with ‘Veda Brahma’ award by Bharatiya Vidya Bhavan in 2013. Prof. R. L. Kashyap has received ‘Sir M. Vishveshwaraya Award’ by ‘Swadeshi Science Movement’ in 2013. He has authored more than 350 research articles of which 220 are published in scholarly journals and the rest were presented at conferences. He has guided above 50 doctoral students. He has written extensively on Veda. He has translated all the 20,500 mantra-s from all the four Veda-s. They are published in 24 Volumes. 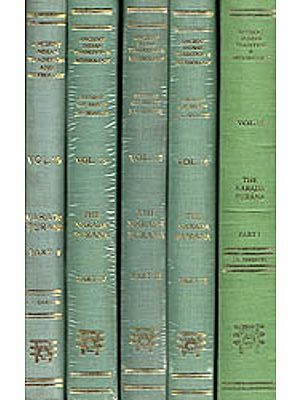 ‘Rig Veda Samhita’- (12 Vols), ‘Yajur Veda’ (4 Vols), ‘Sama Veda’ (2 Vols),’ ‘Atharva Veda’ (6 Vols), Shukla Yajur Veda (2 Vols). Some of his widely read books on Veda are: ‘Why Read Rig Veda’, ‘Rudra Mantra-s’, ‘Essentials of Rig Veda’, ‘Essentials of Yajur Veda’, ‘Essentials of Sama Veda’, ‘Work, Enjoyment & Progress’. He is the Honorary Director of Sri Aurobindo Kapali Sastry Institute of Vedic Culture, Bengaluru. SAKSHI was started in 1997 with the basic aim of translating all the Rik and Yajus mantra-s contained in the core books of Veda-s into English and Indian languages such as Kannada, Tamil, Hindi and Others. By 2013, all the rik and yajus mantra-s of the five Veda Samhita-s namely Rig Veda, Krishna Yajur Veda Samhita-s, Shukla yajur Veda, Sama Veda and Atharva Veda were rendered completely into English and partly to Kannada, Tamil and others. This is a major step. Every Veda book such as Rig Veda has its own associated Brahmana, Aranyaka and Upanishad books. 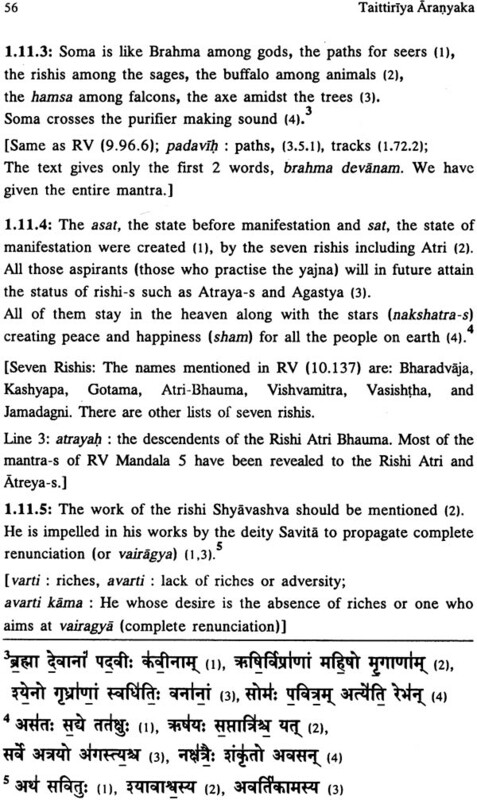 These associated Brahmana and Aranyaka books in four of the five core books namely Rig Veda, Shukla Yajur Veda, Sama Veda and Atharva Veda do not have any rik or yajus mantra-s. But the Taittiriya Brahmana, and Taittiriya Aranyaka associated with the Krishna Yajur Veda have many rik mantra-s. 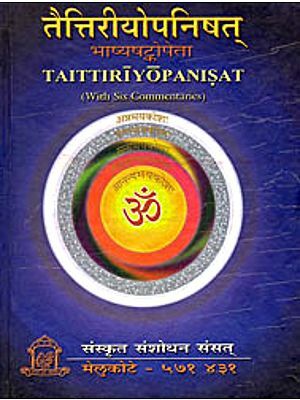 Especially Taittiriya Aranyaka deals with several important Rik mantra-s such as those in the Purusha Sukta, the inner yajna and others. Thus we planned to translate the entire Taittiriya Aranyaka into English first. TA in all has ten Prashna-s (or Prapathaka-s), of which the last four, constitute the Upanishads, Taittiriya and Mahanarayana (or Yajniki). Thus the Aranyaka proper has 6 Prashna-s. If we made one book of all these six Prashna-s, the book would have more than 650 pages and thus would be unwieldy. Thus the translation would be in 2 volumes. The topics in t he Prashna-s four and five are close to one another; thus the translation of these two Prashna-s would be in one volume, which will be labelled as volume 2 by us. It will have about 250 pages. The translations of the remaining four Prahna-s one through three and six constitute the volume one, this book. We will give brief description of the contents of these 4 Prashna-s of volume. 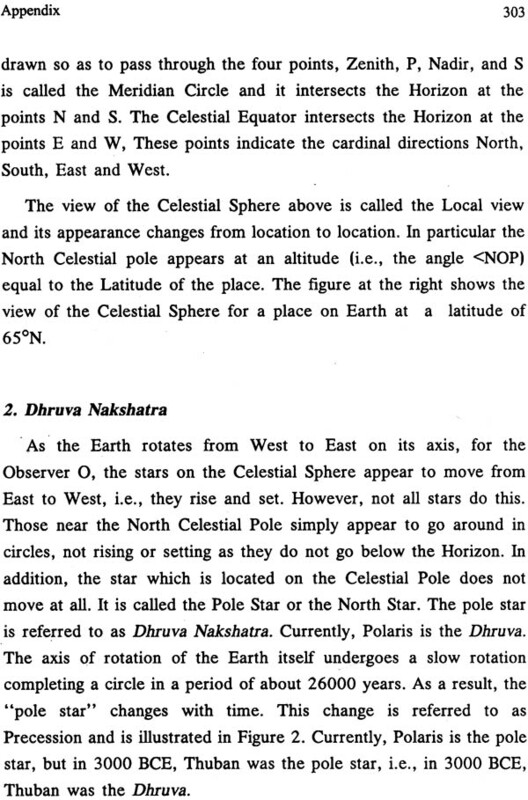 The detailed overviews of these 4 Prashana-s are give elsewhere. The first Prashna usually called as Aruna (or Sun) has 32 anuvaka-s. it has mostly mantra-s, with occasional Brahmana (or prose) passages. It has several anuvaka-s adoring the waters or the dynamical energies; It has the well-known anuvaka 22 entitled Mantra Pushpa. Anuvaka 25 specifically mentions the golden icon of Purusha placed on lotus leaves, indicating the worship of the deities through icons even in the vedic times. 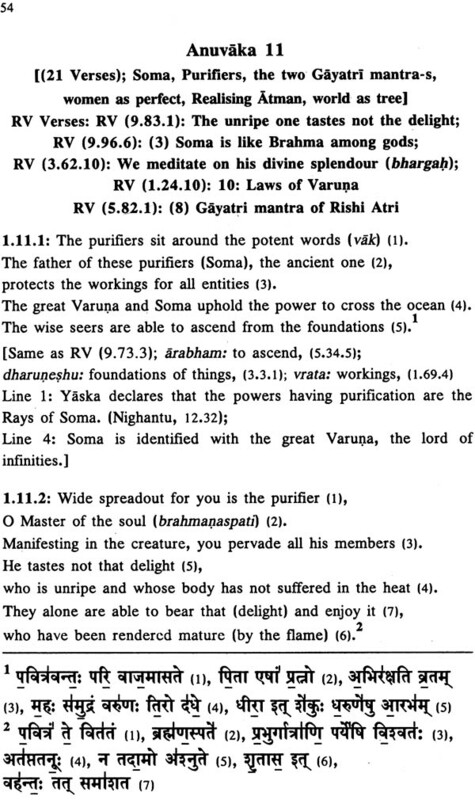 The second Prashna with its 20 anuvaka-s has Brahmana or prose passages and some Rik mantra-s. It is very useful because it gives details of many topics which we only hear during the rituals, such as the five yajna-s, ways of wearing sacred thread, importance of self-study (svadhyaya), unpaid debts and others. The third Prashna with its 21 anuvaka-s has mostly mantra-s. 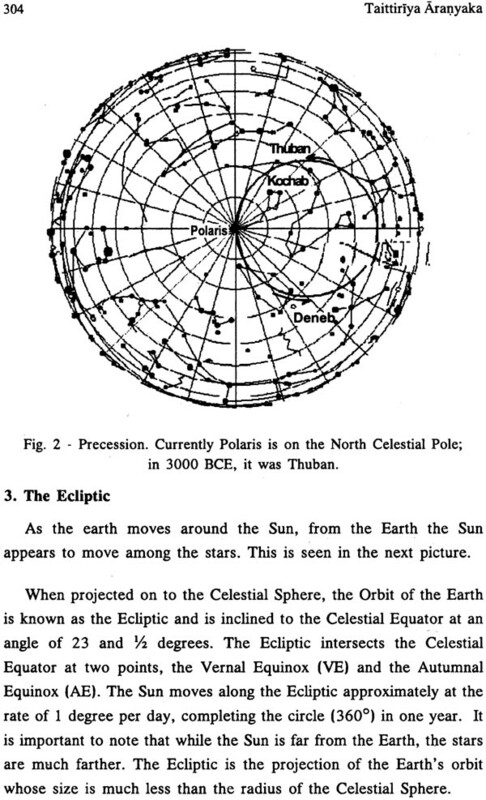 It has the Purusha sukta and details of inner yajna. The sixth Prashna is called as Pitr-Medha, understanding the role of ancient fathers. It has 12 anuvaka-s. It is regarded as dealing with the funeral rites. But this is not correct. 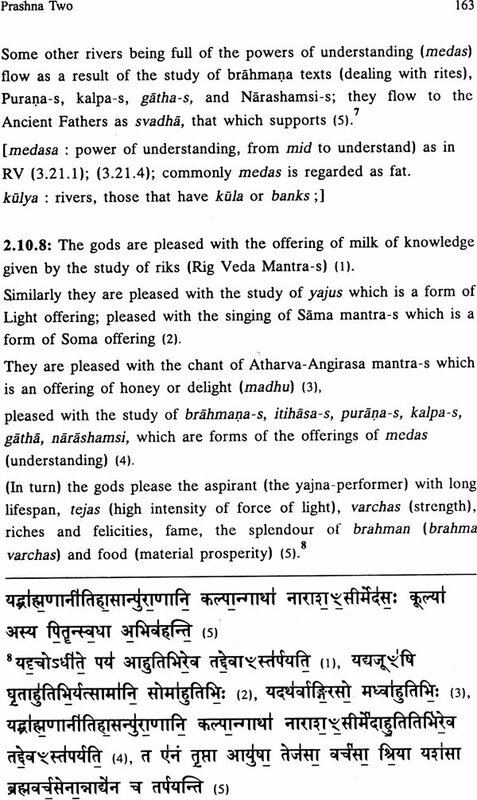 It has at least 50 mantra-s from Rig Veda. It offers a philosophical view of the journey undertaken by the departed one after shedding the physical body. There is no mention of hells or punishment. 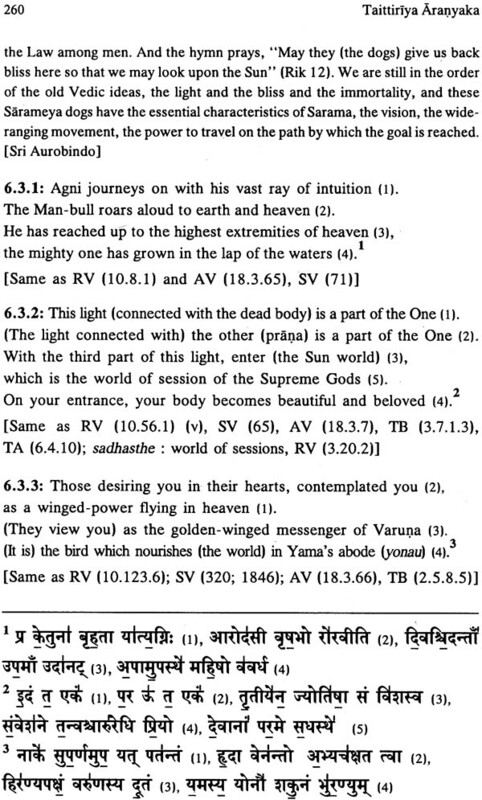 The anuvaka 19 of Prashna one mentions the 4 naraka-s (or hells). The anuvaka 15 of Prashna 3 deals with mrthyu or death. Thus these 4 Prashna-s are interrelated. 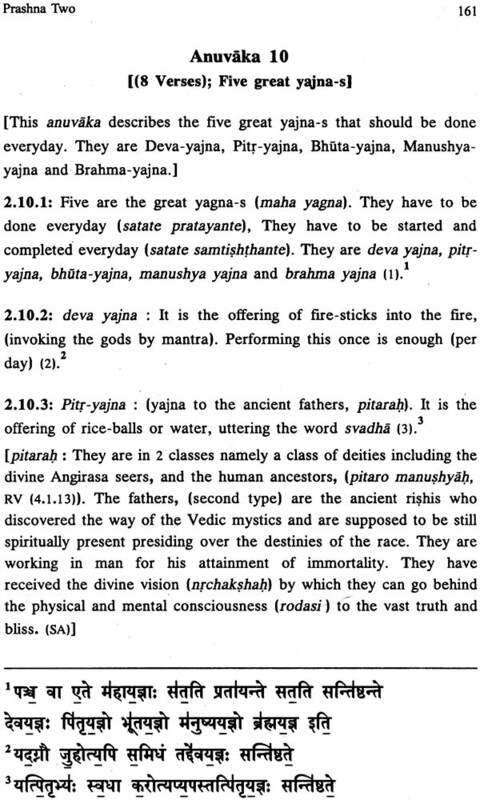 The prashna-s four and five which are in volume 2 deal with Pravargya; the word pravargya is mentioned in TA (1.5.5). Using extensive symbolism, it deals with the topic of rejuvenation of all the three bodies of the yajna-performer. 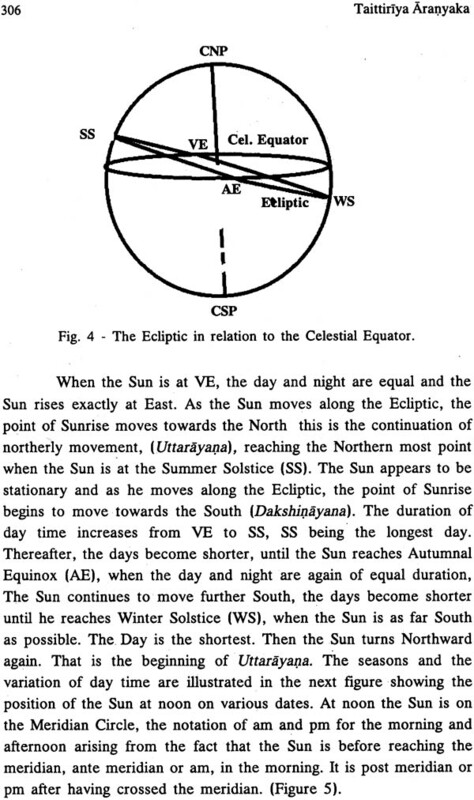 Persons who are very curious about this topic can read the four chapters, 36 through 39, of the Shukla Yajur Veda Samhita, Volume 2, which has been published by SAKSHI. We focus only on the 4 Prashna-s, 1, 2, 3, and 6. Each Prashna is divided into several anuvaka-s. Each Anuvaka is a long passage with no punctuation. Prashna one has 32 anuvaka-s. 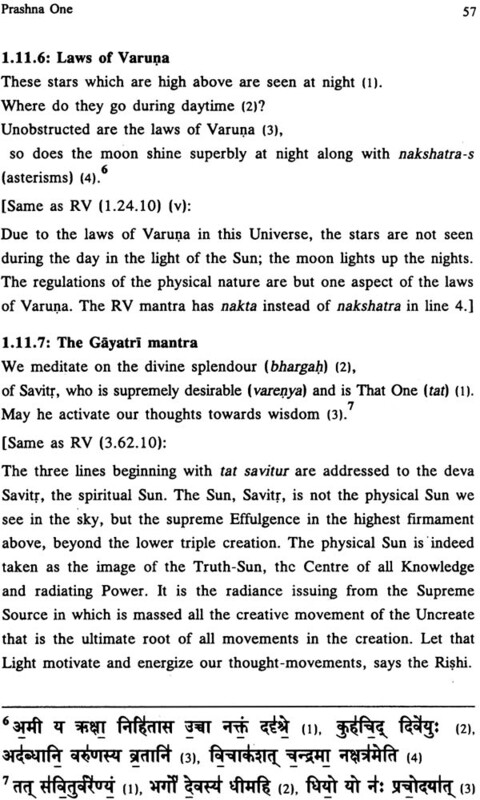 The text of all the anuvaka-s is same in all editions. For purposes of translation, each anuvaka is divided into several chunks, each having about twenty syllables. Each chunk is called a verse. Sometimes a verse could be an entire rik mantra in RV or TS. However it is not correct to label the verse as a mantra. If we add all the verses in the anuvaka-s of Prashna one, we get the total number of verses in Prashna one. In our book, the prashna one has 361 verses, Prashna 2 has 132 verses, Prashna 3 has 108 verses and Prashna 6 has 144 verses, thus the first volume has a total of 85 anuvaka-s and a total 745 verses. The number of verses in a anuvaka varies from verse to verse. 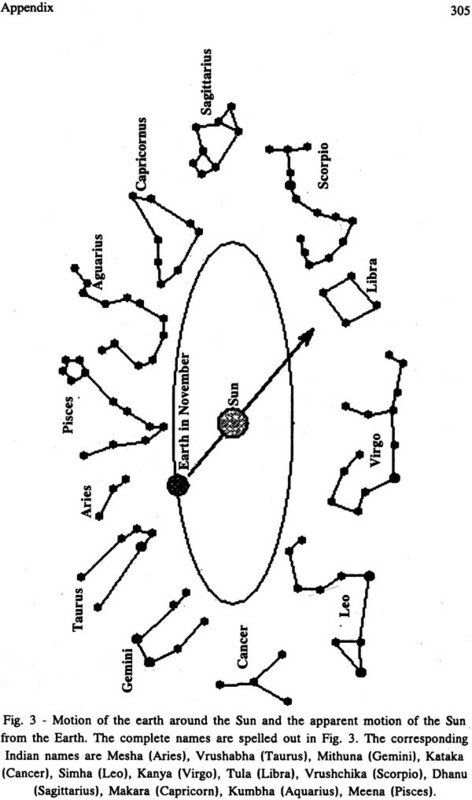 There are many anuvaka-s with just one verse, such as anuvaka 17 through 21 of Prashna 3. Anuvaka (3. 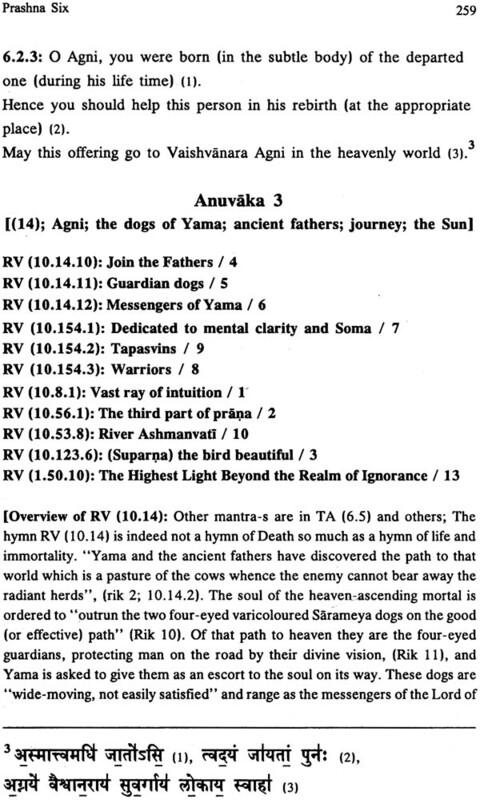 11), having 34 verse may be the longest anuvaka. There are three anuvaka-s with 23 verses. 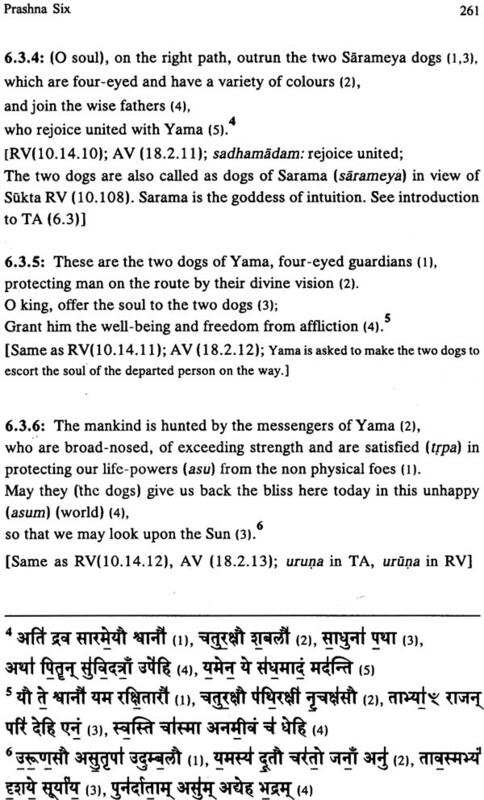 Note that the number of verses in an anuvaka may vary slightly from edition to edition. Some may split a long verse into 2 verses.